NFL Forum :: - Nick Fairley would be pricy but worth it! Nick Fairley would be pricy but worth it! 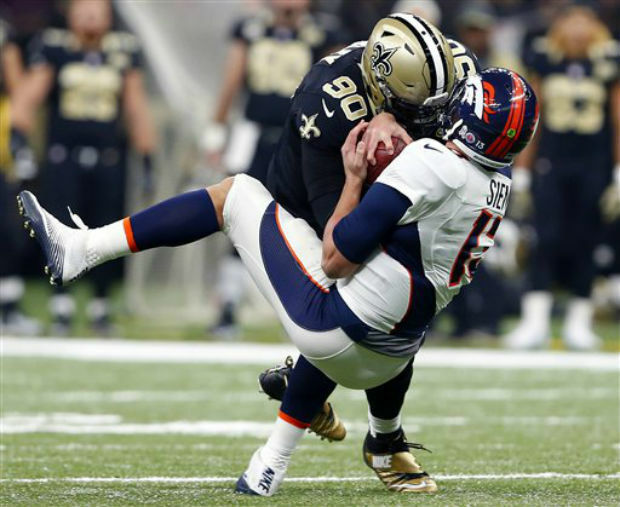 Should Saints resign Nick Fairley? Posted: Wed Feb 15, 2017 9:08 pm Post subject: Nick Fairley would be pricy but worth it! With whispers that Nick Fairley might not be in the best interest of the Saints long-term plans do to the fact that he'll likely command upwards of 10 million per year this offseason, there are many around the NFL that view Fairley as more of a luxury than a necessity for the club. Those who feel that way typically point to the fact that Fairley is a 3 technique defensive tackle the same position the Saints spent the 12th overall pick on Sheldon Rankins for in the 2016 draft. With Rankins making 1st round money and playing like a future pro-bowler along with 2016 4th round pick David Onyemata looking like a potential steal, many wonder if the Saints would be better off investing the money it would take to resign Fairley in to other more pressing needs on the roster. 1. The Saints have overpaid for far worse with much less in return! Jairus Byrd, Colby Fleener, CJ Spiller, Brandon Browner… see where I'm going here? All these players (and more like them) were once free agent acquisitions that cost this franchise a pretty penny only to deliver hardly nothing in return on the investment. While Fairley is a sub-package player, he's a very productive one. Fairley came here on a 1 year prove it deal for 3 million and prove his worth he has. Fairley has excelled in Dennis Allen's scheme and offers the Saints a proven commodity, one in witch they (Saints) already have some built-in equity in making him a sound investment and a safe one in the future opposed to the unknown that is out there on the open market. 2. Fairley is a dam good football player… you don't improve by getting rid of those. Let's put it on the table… despite what anyone feels either about Fairley personally or where he falls on the depth chart, the fact is that Nick Fairley is one of this team's top 5 defensive players and a dam good one too. The Saints play over 60% of their defensive snaps out of sub-packages which basically means that Fairley will see the field more that what a presumed starter like NT Tyeler Davison will. Also the tandem of Fairley and Rankins on the interior with Jordan on the edge was a very impressive defensive lineup toward the end of the season in 2016 and would appear to be something the team would like to build on in 2017. 3. Cam Jordan wants the Saints to resign Fairley and has been public about it. Cameron Jordan (the Saints best defender) has for a long time now been a one man show on the Saints defensive front but that changed in 2016. Jordan openly talks about how impressive Rankins was as a rookie and how much he wants Nick Fairley to return in 2017. Jordan understands that the team has finally found him some much needed help up front and the last thing he wants to see is that help leave as quickly as it arrived. Both Fairley and Rankins penetration on the interior took a lot of burden off of Jordan this past season which helped him post maybe the best year of his career (not including sacks) and Jordan desperately wants that to continue and so should the Saints. 4. Believe it or not but Nick Fairley is a leader an a good influence for the young DT’s. When most people think of Nick Fairley they often think of the young immature overweight former 1st round bust of the Detroit Lions however that simply isn't the case anymore. Since the time the Lions declined Fairley's 5th year option on his rookie contract there has been an awaking within Fairley whose done a complete 180 in terms of maturity and conditioning. Since that time Fairley has taken to take much better care of his body and his approach to the game has become much more committed. After taking a 1 year prove it deal where he excelled with the St. Louis Rams, Fairley landed in New Orleans on yet another 1 year prove it deal where he delivered a breakout season for the Saints. During that time, Fairley has been praised for his communication and leadership over the team's young defensive tackles and has quickly bonded with Saints star defensive end Cam Jordan. Fairley has proved his worth and that he's put his questionable past behind him and that his main focus now is on becoming the best football player and teammate he can be. His trails and tribulations throughout his career that lead him to this point is a great learning experience for the young players on this roster and Fairley is someone they can look up to. 5. The Saints want Fairley and Fairley wants to stay! Here's the kicker… both parties very much want to see a agreement between the two sides happen. The Saints understand that Fairley is a valuable player as both a leader on the team and as a pass rusher on their defensive line. They also understand that players such as that are pricy on the open market. To his credit, it appears that Fairley is also open to giving the Saints a discount as well. Reports today were that the Saints are not willing to exceed the 11 million per year that Jordan is making while Fairley is insisting for more than 9 million per year at a minimum. There's little doubt that on the open market, Fairley could and should command up to 10 million per season and maybe more. It's my belief that the Saints best chance of resigning Fairley is before the NFL free agency period kicks off. Recent rumors of Fairley wanting to test his market value is an old ploy by agents to fast track a quick deal but as we all know Saints GM Mickey Loomis is a shrewd negotiator. This will likely go down to the wire but I fully expect the Saints and Fairley to come to an agreement somewhere in the 9.5 to 10 million per year range on a multi-year deal and give Fairley the contract that he's rightfully earned and give the Saints a sure bet big money free agent signing that will finally provide some dividends. Great post Worm! This year the Saints (financially speaking) are in uncharted territory as they ACTUALLY have cap space (been long time since that happened). I think signing Nick Fairley to 5 year 48 mil contract would work out in the long run. I agree with you except for the 5 year deal... I'd much rather it be a 4 year 38.5 million deal with the 4th year being a team option. To get it done the Saints give Fairley a nice percentage of upfront money in the deal. Fairley is 29 years old and I'd like to see where he's at around 32 and also around that time we should be gearing up for Rankins 2nd contract and may have to let Fairley go then. For me, resigning Fairley is an offseason must for the Saints. Now more than ever you need guys that can get after the QB. Fairley has proven to be disruptive. Resign Fairley, draft a DE to pair with Jordan. Dogpile QBs. Most talk about desperately finding another DE to pair with Jordan like that's gonna solve all our problems... the best defenses in the NFL go 3-4 deep in good pass rushers. Jordan, Rankins and a 1st round DE gives us 3, Fairley could be the player to put this D-line over the top. He is a must resign in my opinion as well. It's not just that he's a good player. He's a been there, done that type of guy. He's had team not resign him, and he's got years of experience that he can tutor the young guys, so you're getting a player and coach. And, when was the last time we heard of him getting in trouble? He's a good locker room/off field guy. That's valuable too. I was excited when we signed him, I'll be excited to keep him. He excelled on the Rams? His stats don't show it, but I realize that can be very misleading for a defensive player. Was it really that good of a season? I've watched very little football outside the Saints the last few years. The stats were misleading... while he only had 0.5 sacks with the Rams as a rotational player, he was rated by PFF as one of the highest graded players at creating pressure on the quarterback that season. So really, the only issue might be age. Vince Wilfork could give us all a lesson about that. While I feel strongly about retaining Fairley... I also don't think it's going to happen. The Saints will not pay Fairley 10 million per season and that's what waiting for Fairley on the open market. Before the Saints put 10 million into a 29 year old interior player were they are deep, I think they let Fairley walk and try to sign a younger edge player like Melvin Ingram in free agency instead. This is a weird one. We've seen Loomis go loose cannon with big money for guys who are issues, only to cut them later and lose that money. It would be nice if we'd actually spend money on guys that are proven to be good, on and off the field. In the end, though, you're probably right. Probably go youth movement in order to save money, and end up where we've always been on defense... a revolving door. ...but a nice, cheap revolving door "at an affordable price". How many teams will we watch DeWight Freeney play on at 35, and make it deep into post season before we realize that sometimes, 1 highly paid player can make a huge difference? We saw it with Reggie White too. And there are others. Now, I'm not saying that Fairly is in that category, but sometimes you need to stick with a proven, at a little more money, than just shooting for young. The issue is however that early rumors have the Saints valuing Fairley at around 6-7 million per season which makes since as they are deep at DT and with Fairley basically being the reserve 3 tech behind Rankins. The problem though is that Fairley's rumored open market value is around 9-11 million per season which is a very big difference. With the Saints still having huge holes at CB and Edge rusher, Fairley at 8+ million per is a luxury this team simply cannot afford (view of the front office). This is also why Fairley wants to test the open market to see if in fact his value is indeed that high. I believe that if and when he hits the market and he finds 9+ million per year elsewhere... he's gone. However if it does not play out like that and the most he finds is 8 million per season, he might be willing to take a little bit less to remain with the Saints say at around 7.5 per year. This however is most likely a pipe dream as there are tons of teams with a crap load of cap space and a premium has been placed on interior pass rushers so Fairley should likely find that big pay day he seeks... it just won't be in NOLA.